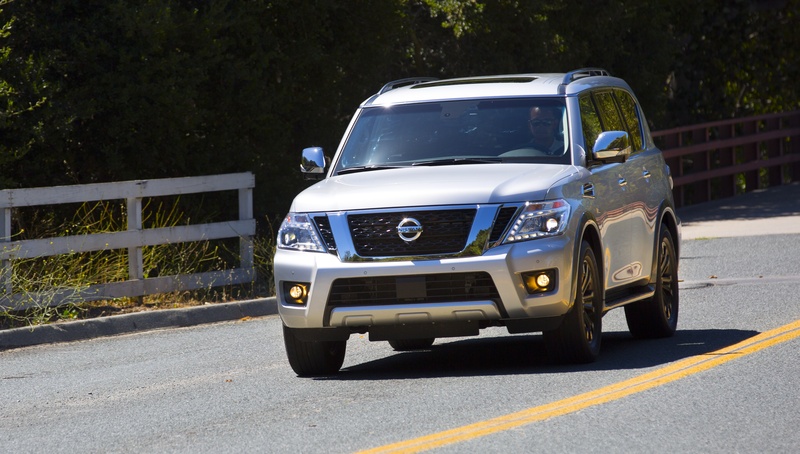 Nissan took a model year off from its largest SUV, the Armada, but it's back for 2017 restyled and re-engineered with a plush ride, a well-equipped interior and a more horsepower than ever. The revamped 5.6-liter, Endurance V8 delivers 390 horsepower, up 73 horsepower from the previous Armada. Two- and four-wheel drive Armadas now can tow a maximum of 8,500 pounds, and both have a seven-speed automatic transmission instead of a five-speed. Its new look is upscale inside and the 2017 model has a generous amount of standard equipment - a premium Bose sound system with 13 speakers, onboard navigation system with an 8-inch display screen, running boards for easy entry and exit, rearview camera, front and rear parking sonar assists, dual-zone climate control, power-adjusting, heated, front passenger seat and power driver's seat with heat and power lumbar support. The top-level Armada, the Platinum version, is so loaded with luxury items like nicely detailed leather seats, rear-seat entertainment system, moon roof and the latest safety equipment that it could challenge many luxury-branded SUVs - including its sibling vehicle, the Infiniti QX80, which is built at the same plant. The starting manufacturer's suggested retail price, including destination charge, is increased from the just under $40,000 price for the 2015 model to $45,990 for a two-wheel drive Armada and $48,895 for a four-wheel drive Armada. Changes to the new Armada start at its platform, which used to be the same as Nissan's full-size Titan pickup truck. The 2017 Armada uses the platform of Nissan Patrol SUV, which has a long, reliable history as a workhorse around the globe. As a result of this new platform, the 2017 Armada is built in Japan, not Mississippi where the Titan is made. The Armada's outer styling now is more squat and muscular, though it rides high above the pavement and has a step-in height of more than 22 inches. Inside, the hard, cheap-looking plastics on the dashboard and inside doors are gone and replaced with nicer-looking, soft-touch plastic. The seats are pleasantly finished and there are lots of control knobs and buttons on the dashboard. The V8, which has been a staple of the Armada since its beginning in 2003, is reinvigorated with direct gasoline injection and an improved variable valve system. There's a bit more torque, too - 395 foot-pounds at 4,000 rpm compared with 385 foot-pounds at 3,400 rpm before. The power is palpable. Even nudging the accelerator pedal brings a hustling V8 response. Even more impressive is how quickly the Armada, which weighs more than 2.5 tons, can get up to speed - its 0-to-60 mph time of 6 seconds is better than many smaller, lighter SUVs. There is a price to be paid at the gas pump, though. The test Armada Platinum 4WD, which was zestily driven, averaged only 13 mpg on mostly city streets and congested highways. The federal government rates this model at 13/18 mpg for a combined 15 mpg. The gas tank holds 2 fewer gallons than its predecessor, so the travel range on the test vehicle was a poor 338 miles. The suspension keeps jarring bumps at bay but also produces a soft ride with some bounciness over highway expansion cracks. The steering can feel overly assisted. 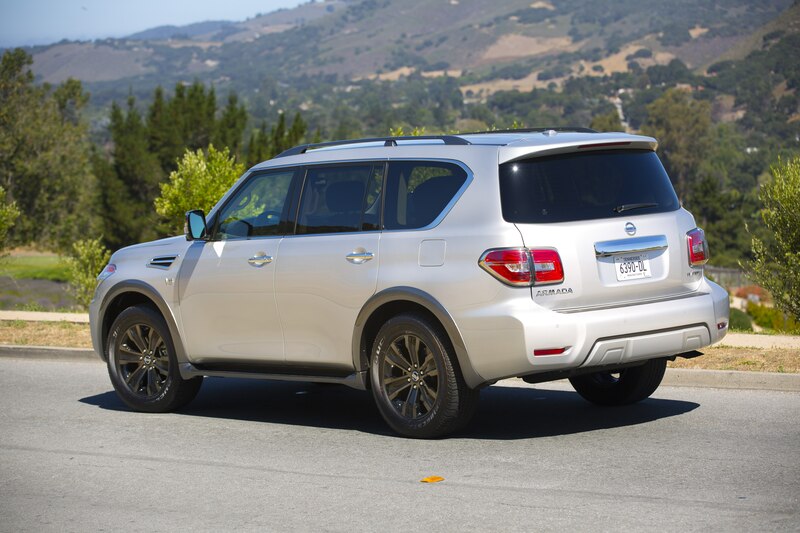 Nissan's other changes reduced some space in the Armada's third-row seat and cargo area behind the third row. Legroom now measures 28.4 inches compared with 32.2 inches before, and third-row shoulder room is reduced by 3.2 inches to 60.5 inches, even as headroom grew to 36.4 inches. Cargo space behind the third row now is 16.5 cubic feet, which is just a half cubic foot more than the trunk of a Toyota Avalon sedan. Maximum cargo space is 95.4 cubic feet when the second- and third-row seats are folded down, though getting items into the Armada requires some lifting because the cargo floor is about at waist level.